The big Linux conference down in the land of Oz just completed and there are no really big shows on the agenda until Atlanta’s Great Wide Open opens its great doors wide in March. Everybody here in North Carolina, which I call home, is on the road, hanging out in Baghdad-by-the-Bay waiting to see how well the Panthers play in fog and trying to pretend to be old hats at having a pro home team worth the effort of a root or two. If you’re a Windows user, which most of you reading FOSS Force aren’t, then Microsoft wants to hijack your machine. It seems that the company that’s been spending millions — and has been buying into every free and open source conference it can find and a few it can’t — to get the word out that “Microsoft has changed,” hasn’t. If you happen to be unlucky enough to be using Windows 7, 8 or 8.1, you’re probably beginning to realize this right about now. Windows users might be well advised to think about unplugging their computers from the Internet when they’re not around to keep an eye on things or they’re likely to wake-up in the morning, or return home from work, to find they’re running Windows 10 instead of whatever version they know and love. Every mainstream tech site on the Web has been reporting that on Monday the head honchos in Redmond decided, after one too many Frappuccinos at the local Starbucks, to return to the Microsoft campus to flip the switch on the old Kaypro luggable they’re using as a server these days, so it could begin the process of converting every Windows computer in the multiverse to Windows 10 — by force if necessary. 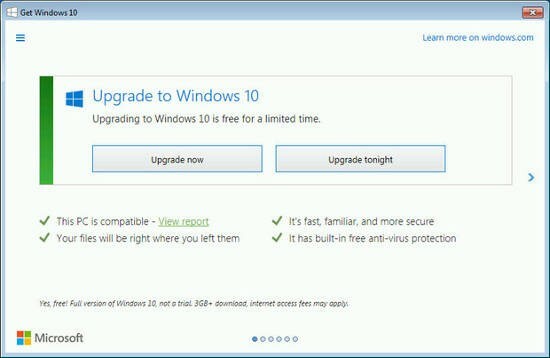 Microsoft points out that users can always opt out and say “no” to the “upgrade,” but Joel Hruska over at Extreme Tech ain’t buying it. “I’m dubious of this for several reasons. First, we’ve already seen what Microsoft’s version of ‘No’ looks like.” He then reveals a screenshot from Microsoft’s GWX that doesn’t really show a clear cut way to stop the upgrade, but does let users put it off until they’re asleep, so they don’t have to actually be there as their old operating system is being put down. The good news is that if Windows users follow the steps laid out on How-To Geek and other sites, they can avoid waking up in the morning to find their beloved Windows 7 has been replaced by dreadful Windows 10. The bad news: After taking these steps, users will then have to apply updates manually forever to avoid having their machines highjacked. There’s no news yet on whether Symantec and AVG are planning to now include Windows Update software as part of their virus definitions. Ubuntu bringing GNU/Linux to a tablet near you: IMHO, the news that Ubuntu will be coming out with a tablet next month was actually the big story of the week, but we’ve covered it already, so I bumped it down to the number two position. Besides, I’ll be letting you know what I think about this on Monday morning. All’s not quiet on the Linux virus front: First it was Ken Starks’ article chronicling the installation of Avast antivirus on a Linux home computer, followed by our Linux antivirus poll. Then on Thursday a website called SPAMfighter published an article with the downright scary title “Linux Computers Becoming Increasingly Malware Prone,” which lists several examples that might or might not be FUD. I’ll let you read the article and decide for yourself. Meanwhile, on Monday Maria Korolov reported on InfoWorld that “27% of all malware variants in history were created in 2015.” Again, I’ll let you read the article and decide for yourself. Another day, another distro gone: It’s a sad, sad day in Germany as openSUSE 13.1 Linux has reached the end and has been removed from support. Evergreen, the hospice care workers for terminal operating systems, will be keeping the patient supplied with a minimal number of patches until it finally falls into that good sleep and is carried off by penguin angels. Quick takes: Remember the Turing Phone, the “unhackable” Android phone made of liquidmorphium that so many people preordered last year? Well, it seems that now the Turing folks have changed their minds about the OS and will be offering it with the MeeGo based Sailfish OS. This is an odd move for a couple of reasons. One: Jolla, the keeper of Sailfish, seem to be on its last legs. Two: Where does that leave the countless number of folks who’ve ordered one, expecting an Android phone? … As Mr. T would say, pity the poor fools who trusted terabytes of data with Copy.com, the cloud company that offers nearly unlimited storage. They’re under notice that they have until May 1 to find a new home for their data and get it moved. Copy is going out of business. Parting shot: Today marks the halfway point for our Indiegogo 2016 FOSS Force Fund Drive. The good news is that we hit the halfway mark having raised $1,685, which is 46 percent of our goal, just 4 percent short of where we’d like to be at this point. The bad news is that…well, there’s not really any bad news except we’re not there yet. Right now we’re only $2,015 away from making our goal. Without your help, we can’t do it. But with your help, FOSS Force becomes stronger and better. Read my article on our new member community and then go to Indiegogo and make at least a $25 contribution to become a member. Or just go to our Indiegogo page and help us out. Either way, on behalf of all of us at FOSS Force, I thank you. Whell, when comes to Windows vs Linux I have said my opinion on that one. Switch to Linux now, so that you don’t cry later! One Windows machine, a game box. Haven’t turned it on in a year, in part due to the Windows 10 thing, force upgrade, sure is making me think of converting it to a only Linux box. If they wouldn’t be using the methods their using, it would be left alone as a Windows box, awaiting time to play games OF MY CHOOSING, not theirs. After reading an article earlier today that even with telemetry and everything else turned of that you can, the enterprise version of win10 still phones home numerous times per day, and not knowing what is sent to M$, the only thing I can say is folks need to avoid win10 like the black plague! Its clear that M$ not only wants to own the computer that YOU paid for, but every bit of data on it! And by the methods they are using, they are very determined to accomplish their goal of owning your computer and data by any means that they can, with or without your permission or consent! I think that their actions to try to force win10 installs without user consent qualifies them to be charged under the computer fraud and abuse act!! !